The Flour Loft: 11 years! Today i am celebrating.. my 'lovely' man and i have been married for 11 years. I am at home today and have been looking through the box of our wedding and honeymoon photos.. we look so young! 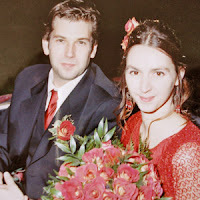 ( though we wern't that young in respect of getting married.. i was 28 and he was 32) . Even though we are the same people, we are also different. Time has changed our appearances, sometimes changed our opinions, definately played with our emotions but has i am happy to say taught us that we can grow together. I can't say it has all been easy, we have had our fair share of sadness and worries, but the cord that holds us together is still strong, even if it needs a little dusting and care at times. I truly love my man, i respect him and want to grow old with him. We have created a warm home together, now a garden, and our precious children. I feel very blessed to share my life with this special, kind man. We are also learning to let each other be selfish sometimes too. (and not get narked)! My journey in life is constantly changing and throwing new things into the 'pot', and i hope this special unity can survive the harsh realities of life. I feel optimistic that we can and i feel that love, communication and sensitivity to each others' needs hold the key. I also found the book i put together of our Wedding cards and another book filled out with messages on the day. Some of those who shared our lovely day are no longer here, so to read their words and their sentiments is so moving. We had a small affair, 40 people, immediate family and all our friends. My dress was a burnt orangy, red. It was made by my costume making girlfriends. The wedding car was our beautiful old Triumph Vitesse, 'Rosie', sadly in car heaven now and the invites, the cake and hall decoration were all created by friends. A real all pull together affair which for us made it all the more special. It was such a happy day. My man is fairly shy, but it was an intimate civil wedding so not too grand. We honeymooned in Tuscany near Lucca, up in the hills. Ahh ... memories. I am planning to cook a meal tonight for my ' beau', and have taken ingredients from the garden and aim to make a meal with an Italian slant.... basil, tomatoes, courgettes, oak leaf lettuce, rocket and rhubarb (not italian i know), but in the garden and we like it. I shall be buying mozzarello ( heaven), and various other bits including some wine. My friend Amanda, has suggested i make an 'ice bowl'? to serve the ice cream from. Not sure if this is going to work but have one in the freezer.. freezing, filled with borage flowers and mint leaves. All a bit of fun ... will let you know how it goes. Today has had me reflecting on my relationship...and made me value it more than ever. Hold those you love close, listen to them and treasure them. Happy Anniversary Ginny! What a beautiful and honest post. Enjoy your meal. Congratulations on your anniversary. I hope you have a lovely dinner together this evening. Your Wedding photos look lovely and the day itself sounds just perfect. I hope that if I finally get to have a Wedding of my own, now I'm in my 30s, I'd like something like that rather than the big affair I would have thought of if I'd got married younger. The honeymoon sounds perfect. We went to Lucca a few years ago to celebrate my Dads 60th Birthday. It's such a magical place. Have a really happy day. Happy anniversary - beautiful post. Euan and I had a very personal wedding too - made the dress, did the flowers, friends and relatives provided cake, catering, stationary and we walked from my parents down to the church. I think it is that sense of connection that makes me enjoy doing wedding flowers for other poeple now. Isn't it scarey how young we look when we get married? I'm sure that if I saw my 23 year old self now I would say "too young, too young" - it is probably just the wrinkles talking. Perhaps being married is just VERY ageing. Do enjoy your special dinner and the rest of the evening. Congratulations! A happy marriage is one of the greatest of achievements and a wonderful gift to your children. I wish you many more happy years together. Happy Anniversary. What a beautiful post. It's always lovely to read about someone elses day, and how they felt on it. 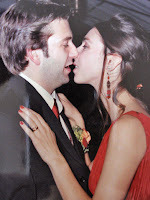 I am, still a relative newlywed, we got married on Midsummer's day last year, and going over the photos it seems such a long time ago, and yet no time at all. Marriage is one of the most wonderful events - it's something that you can't comprehend until you are married but all the subtle differences in the relationship are wonderful. I hope you have the most delicious meal (it sound heavenly!) and I hope there are many more anniversaries to come! Happy Anniversary to you too Ginny! thanks for your comment, how funny your anniversary is the day before mine and you've been married a year longer - its a lovely post. Congratulations on the book! Many congratulations to you both Ginny. Sorry to be so far behind in reading your blog, but I am trying to catch up!